The domain of fast, smooth rip cutting belongs to the table saw, but the design of the saw can have a big impact on how useful it will be. These six top-ranked table saws in our list all come from leading manufacturers and represent both portable jobsite saws as well as more traditional cabinet saws. The traits which set them apart are more apparent in the accessories and table design than in the power and performance available. Regardless of which one appeals most to you, your garage, shop, or jobsite isn’t complete without one of the best table saw models on the market. Table Saw vs Miter Saw – Which Do I Need? 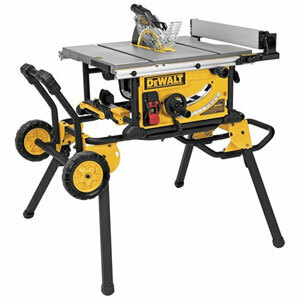 DeWalt is no stranger to our top recommendations and many consider this model to be one of best table saws for the money. The table can handle widths of up to 32.5 inches out of the box, and the standard 10-inch blade will cut through a thickness of 3 1/2 inches. One of the most appealing features is the collapsible stand that transforms from a work table into a rolling hand truck quickly and easily. Best of all, the stand is very stable, and supports enough weight for you to make any cuts that the saw’s 15 amp motor is capable of. Whether you’re ripping soft or hard woods, the DWE7491RS is built “jobsite” tough but simple enough for a weekend hobbyist to take on home projects. To help you reduce dust and keep your work area manageable, this unit include a dust exhaust port that can be connected to a shop vac or other vacuum system. The biggest disadvantage of the DWE7491RS is that it does not accept accessories from older models like the 744. This is an inconvenience for people who need to use the dado plate or other tools, but it does not affect the day-to-day operation of the machine. Other complaints revolve around the stand and the fact that it requires a bit of assembly before use. Even with these slight negatives, the DeWalt table saw is still our top pick, and perfect for high volume work as well as novice woodworking. 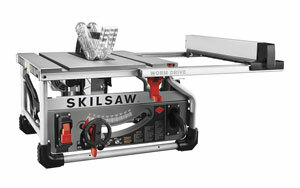 This 1.75 horsepower cabinet table saw is designed to provide both safety and versatility. A 36-inch professional T-Glide fence system ensures smooth operation, precise measurements, and a smooth lockdown without the risk of deflection. 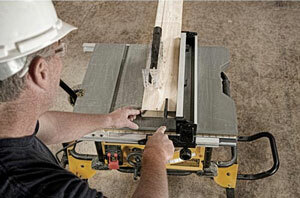 An extension table makes larger projects easy, and the device comes with the SawStop safety system. Many stories from owners start out the same way: “I pushed myself to buy this saw”, noting the cost. They always end up adding “I don’t regret it”. The safety features which make this saw more expensive are far cheaper than medical bills, and the degree of accuracy is profound. With its combined focus on quality and safety, the PCS175-TGP236 is one saw that parents aren’t afraid to teach their children on. 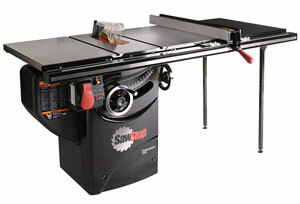 Features and performance considered, we believe this to be one of the best cabinet tables saws you’ll find. Finding fault with this table saw is extremely difficult. The dust collection’s position right at the blade means it doesn’t always catch everything, leaving small piles at the base. While the occasional defective part is found, SawStop’s customer service is quick to remedy the situation. This 5 horsepower wonder uses brass gears for its worm drive, providing maximum power and torque. A 25-inch rip capacity and 3.5-inch cutting depth allows you to rip a variety of materials. Its 15-inch dual-field motor means increased cutting speed while extending the motor life. Best of all, this 10-inch saw is fully portable. 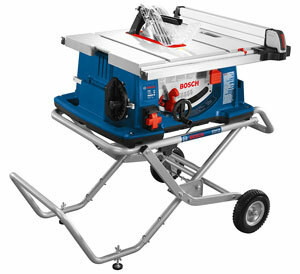 No vibration, little noise, and plenty of built-in storage makes this saw a true winner in the eyes of most owners. The small size means it’s easily portable and can fit into cramped spaces, but at the cost of not having its own base. It’s also easy to do bevels with this saw, as the miter gauge adjusts and locks in place with ease. The SPT70WT-01 is one of those rare instances where an otherwise excellent product is marred by a single piece. A percentage of users all agree that the fence design is slightly flawed and will often set at an angle when adjusted, requiring you to check the alignment using a good square. Hopefully an upgrade will become available with a better fence design. When you want an impressive, yet attractive cabinet table saw, it doesn’t get much better than this! Dust collection is highly efficient, thanks to the blade surround and collection hose design. Its tool-less guard has independent side leaves for improves safety and ease-of-use. Meanwhile, the miter gauge pivots up to 60 degrees to either side, allowing for a range up to 120 degrees. Best of all, this saw only requires a standard 115 volts to run. It’s hard to do much better than a Powermatic, as the PM1000 proves. The fence is easily aligned, there’s no vibration when cutting, and the power is more than enough to compete with contractor saws. You might need to run to YouTube when setting up the riving knife, but otherwise even the assembly is a cinch with this saw. Yet another excellent product, customers admit the only faults they can find are nitpicks. For example, this model doesn’t have a thin kerf knife like its sibling, the PM2000. Also, while the fence is sturdy when locked down, it’s designed with only a single attaching point in the front. Adding a guide track for the back would add to the value of this magnificent saw. The Bosch 4100-09 is a solid tool, built for heavy use under jobsite conditions. Unlike the Dewalt, this model comes with enough accessories to do just about anything you need, including exclusive components such as the T-slot miter gauge, and Bosch’s innovative modular smart guard safety system. To save you time and energy, the stand uses gravity rise technology that makes setting up and breaking down the saw easier than ever. The 10 inch blade, 15 amp motor and depth parameters are typical of any table saw, but the ease of setup is where the Bosch stands out. Weighing in at only 58 pounds, it’s one of the most portable table saws available but the stand feels a little too shaky and may have a tendency to wear out sooner than expected. For some, the table is also a bit too small but that’s the trade-off with high portability. 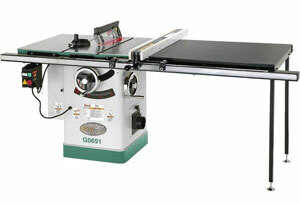 The full-size G0690 table saw is a cabinet model with more features and accessories than any of the competition. At a little over 500 pounds, it’s much sturdier than any portable jobsite model and would make a great choice for your workshop or garage. Even though it uses the typical 10-inch blade, the design of this table limits cut depth to only 3-1/8 inch for a 90 degree cut, and even less for beveled rip cuts. On the other hand, this is the only table which includes things like the riving knife and dado insert. For many, the deciding factor will be the 220V power requirement, which may not be readily available in home shops or new construction jobsites. Even this drawback has a benefit, though, because the Grizzly table saw packs more power into its 3 hp system than you might expect. Technically, a table saw can do what a miter saw does, but not as accurately. Miter saws are designed specifically for cutting miters and are masters of what they do. They are also designed specifically for cutting across the width of a board. 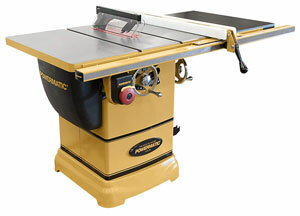 Table saws can cut miters almost as accurately with the right accessories, but any dedicated workshop will have both. What makes table saws shine is their ability to rip (cut along the length) as well as doing cross cuts. Thus, if you can only afford one of these two tables, it’s best to start with a table saw and add the more specialized miter saw down the road.